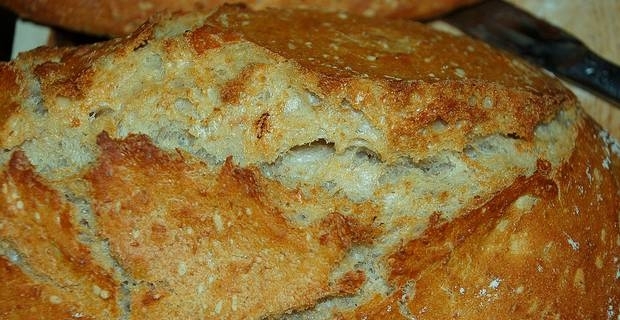 Sourdough bread has a distinctive flavour that sets it apart from other loaves. The secret is in the raising agent, a starter that uses natural yeasts from the air and in the flour rather than fast-acting commercial yeasts. Once you have created a good starter, it can flavour your loaves for years. Artisan sourdough bread is fashionable and widely available at delicattessens and farmers' markets. With loaves costing £2 and upwards though, it is more economical and satisfying to bake your own. Once you have the sourdough starter, the rest is straightforward. A starter begins with a basic flour and water mixture that draws its yeasts from the atmosphere and from the natural yeasts in the flour. The BBC's baking guru Paul Hollywood recommends adding a few chopped organic grapes to the starter to aid the fermenting process. The flour and water paste is stored in a sealed jar until fermentation begins. It is important to refresh and feed the starter with fresh water and flour at regular intervals. Think of your starter as a living Tamagotchi that requires faithful maintenance. After about a week, your starter should be lively and bubbling and ready to use. Combine 250g of starter with 370g of strong bread flour and enough water for a moist dough. From here, use your normal procedure for bread, although the dough may seem livelier when you knead. Sourdough's strong flavours are brought out by slow proving. Don't be alarmed if the dough does not rise as quickly as with commercial yeasts. Allow it to prove for several hours. The defining characteristics of sourdough bread are a tangy, almost fruity taste and a dark, chewy crust. It's essential that you don't underbake a sourdough loaf as the results can be stodgy. Allow twenty minutes at a high temperature, before lowering the heat for a further twenty minutes, helping the crust to darken.